John Mulaney inspired continuous laughter during his March 14 performance the DeVos Performance Hall during Gilda’s LaughFest. During his Grand Rapids visit Mulaney darted onto stage, and did not hold back from any of his jokes. Keeping up with the high strung energy that makes him seem like a 12-year-old boy. Mulaney was quick to note where he was performing by referencing the DeVos 60/60 interview. The crowd was quick to jump into laughter with this opener. Mulaney delivered a solid introduction that focused on Michigan jokes. Making his act unique to those who came out to see him. Mulaney’s comedy keeps up with his previous performances, still holding up to having the most solid delivery in stand-up. Mulaney does not pull away from his punchlines, but rather punches you in the face with them. Making them all the more funnier. Mulaney’s comedy continues to focus on his own personal experiences, his marriage, religion and parents believing he is gay. Mulaney strayed away from popular political jokes until the very end. Finally addressing what was on all of our minds, making the pay off so much stronger. 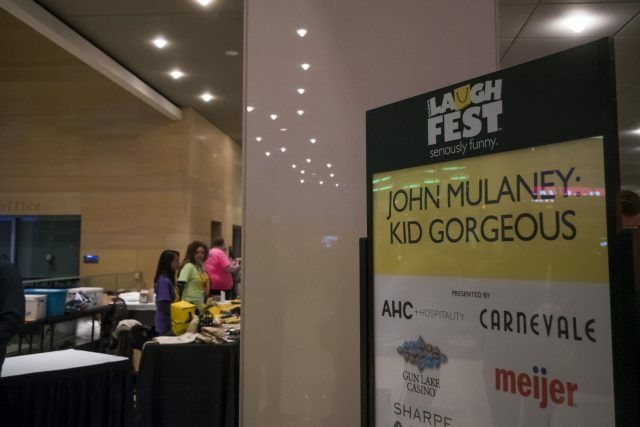 John Mulaney continues his national tour with “Kid Gorgeous.” If you are interested in checking out his work you can watch “The Comeback Kid” available on Netflix now.